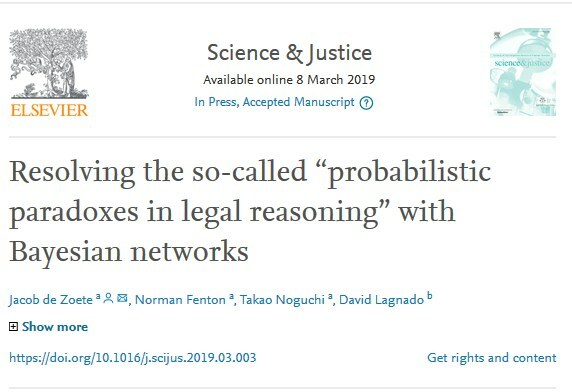 We have previously always tried to capture all of the competing hypotheses and evidence in a legal case in a single coherent Bayesian network model. But our new paper explains why this may not always be sensible and how to deal with it by using "competing" models. The full published version can be read here. This work arose out of the highly successful Isaac Newton Institute Cambridge Programme on Probability and Statistics in Forensic Science. 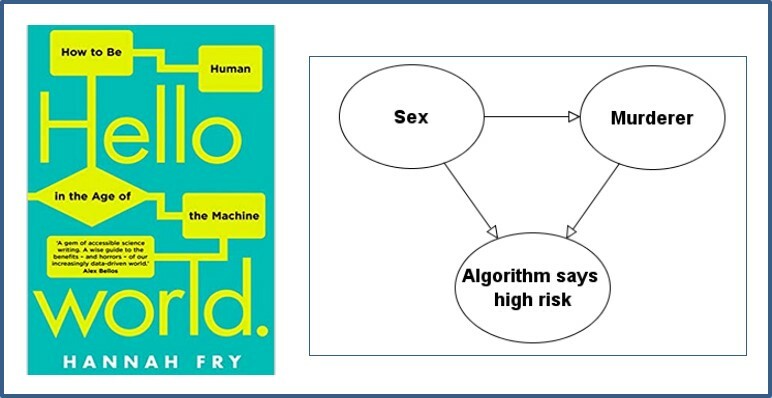 “Hello World” is an excellent book by Hannah Fry that provides lay explanations about both the potential and threats of AI and machine learning algorithms in the modern world. It is filled with many excellent examples, and one that is especially important is in Chapter 3 (“Justice”) about the use of algorithms in the criminal justice system. The example demonstrates the extremely important point that there is an inevitable trade-off between ‘accuracy’ and ‘fairness’ when it comes to algorithms that make decisions about people. While the overall thrust and conclusions of the example are correct the need to keep any detailed maths out of the book might leave careful readers unconvinced about whether the example really demonstrates the stated conclusions. I feel it is important to get the details right because the issue of algorithmic fairness is of increasing importance for the future of AI, yet is widely misunderstood. I have therefore produced a short report that provides a fully worked explanation of the example. I explain what is missing from Hannah's presentation, namely any explicit calculation of the false positive rates of the algorithm. I show how Bayes theorem (and some other assumptions) are needed to compute the false positive rates for men and women. I also show why and how a causal model of the problem (namely a Bayesian network model) makes everything much clearer. Fry, H. (2018). "Hello world : how to be human in the age of the machine". 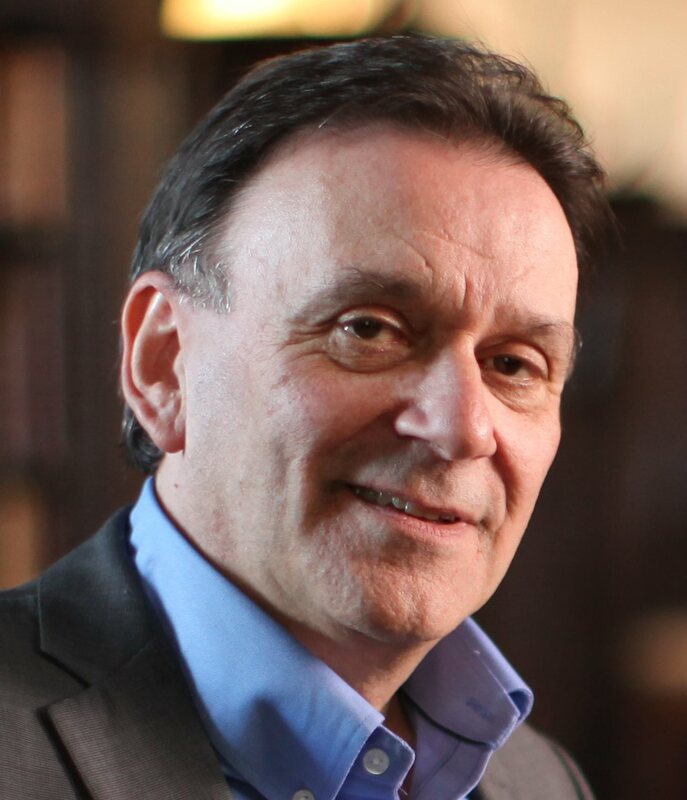 New York: W. W. Norton & Company, Inc.
A paper published today in Topics in Cognitive Science is one in a series of analyses of a Dutch murder case, each using a different modelling approach. In this case a woman was murdered while out walking with her husband in a quiet recreational area near the village of Simonshaven, close to Rotterdam, in 2011. The trial court of Rotterdam convicted the victim’s husband of murder by intentionally hitting and/or kicking her in the head and strangling her. For the appeal the defence provided new evidence about other ‘similar’ murders in the area committed by a different person. The idea to use this case to evaluate a number of different methods for modelling complex legal cases was originally proposed by Floris Bex (Utrecht), Anne Ruth Mackor (Groningen) and Henry Prakken (Utrecht). In September 2016 -as part of our Programme Probability and Statistics in Forensic Science at the Isaac Newton Institute Cambridge - a special two-day workshop was arranged in which different teams were presented with the Simonshaven evidence and had to produce a model analysis. At the time the Appeal was still to be heard. 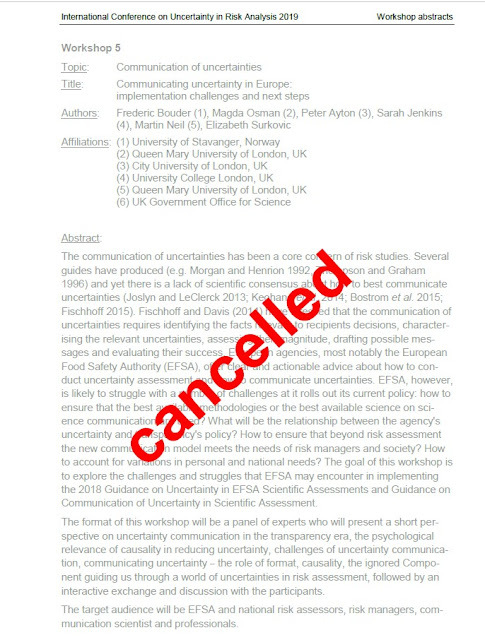 In a follow-up workshop to review the various solutions (held in London in June 2017 as part of the BAYES-KNOWLEDGE project) the participants agreed to publish their results in a special issue of a journal. This paper describes the Bayesian Network (BN) team's solution. One of the key aims was to determine if a useful BN could be quickly constructed using the previously established idioms-based approach (this provides a generic method for translating legal cases into BNs). The BN model described was built by the authors during the course of the workshop. The total effort involved was approximately 26 hours (i.e. an average of 6 hours per author). With the basic assumptions described in the paper, the posterior probability of guilt once all the evidence is entered is 74%. The paper describes a formal evaluation of the model, using sensitivity analysis, to determine how robust the model conclusions are to key subjective prior probabilities over a full range of what may be deemed ‘reasonable’ from both defence and prosecution perspectives. The results show that the model is reasonably robust - pointing generally to a reasonably high posterior probability of guilt, but also generally below the 95% threshold expected in criminal law. The authors acknowledge the insights of the following workshop participants: Floris Bex, Christian Dahlman, Richard Gill, Anne Ruth Mackor, Ronald Meester, Henry Prakken, Leila Schneps, Marjan Sjerps, Nadine Smit, Bart Verheij, and Jacob de Zoete. A new paper published in Science and Justice exposes why common claims that probability theory is incompatible with the law are flawed. Both intuitively and legally it is clear that the evidence should be considered relevant. But according to probability theory (Bayes' theorem), the evidence has 'no probative value' since it provides no change in our belief about whether Fred is more likely than his twin brother to have been at the crime scene. Hence, according to probability theory the evidence is wrongly considered inadmissible. Specifically, such problems are intended to show that use of probability theory results in legal paradoxes. As such, these problems have been a powerful detriment to the use of probability theory in the law. The new paper shows that all of these puzzles only lead to ‘paradoxes’ under an artificially constrained view of probability theory and the use of the so-called likelihood ratio, in which multiple related hypotheses and pieces of evidence are squeezed into a single hypothesis variable and a single evidence variable. When the distinct relevant hypotheses and evidence are described properly in a causal model (a Bayesian network), the paradoxes vanish. Moreover, the resulting Bayesian networks provide a powerful framework for legal reasoning. de Zoete, J., Fenton, N. E., Noguchi, T., & Lagnado, D. A. (2019). 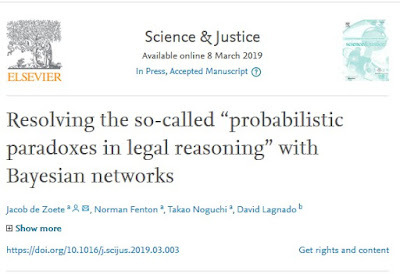 "Countering the ‘probabilistic paradoxes in legal reasoning’ with Bayesian networks". Science & Justice 10.1016/j.scijus.2019.03.003. Neil, M., Fenton, N. E., Lagnado, D. A. 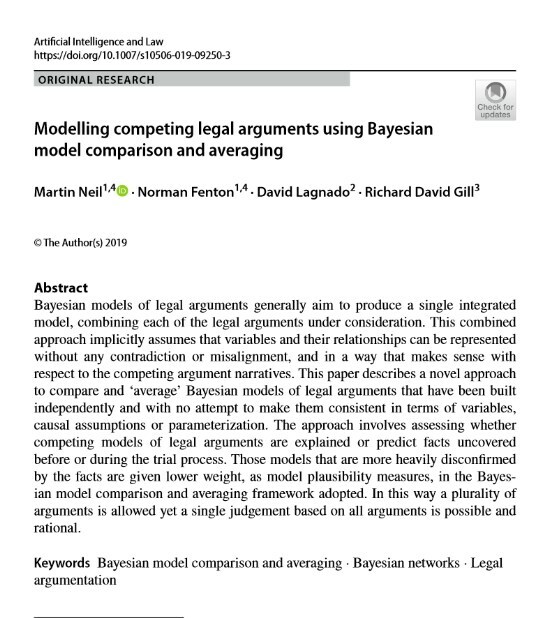 & Gill, R. (2019), "Modelling competing legal arguments using Bayesian Model Comparison and Averaging". to appear Artififical Intelligence and Law . The full published version can be read here. **This particular puzzle is easy to 'resolve'. The 'non-probative' Bayes conclusion is only correct if we assume that the only people who could possibly have committed the crime are Fred and his twin brother. In practice we have to consider the possibility that neither committed the crime. While the eye witness evidence fails to distinguish between which of Fred and his twin was at the crime scene the evidence results in the probability that Fred was at the crime scene increasing in relation to the hypothesis that Fred was not at the crime scene. expert knowledge of the causes of deterioration can be combined with statistical data to adjust predictions. 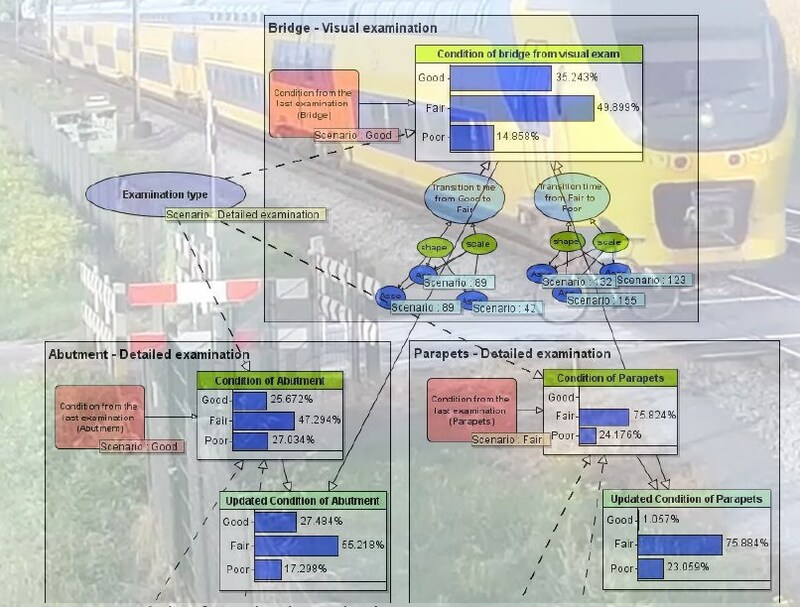 The model (which was developed using the AgenaRisk software) is applied to a case study of bridges on the rail network in the UK. A full pre-publication version is available here. I was specifically invited on the program – the brief was that there was a very speculative technique now available via the NHS, that is claimed to use Nudge methods to help lose weight (because, the rationale is that it is designed to target people's unconscious processes subliminally – this is grossly inaccurate for reasons, first, because subliminal means below the threshold of conscious attention, but people’s attention is consciously directed to the messages being played to them via this NHS weight loss technique, and second, nudge has nothing to do with targeting the unconscious subliminally). They were aware that I have critical views on nudge and on work to do with the unconscious and so they wanted an expert to discuss the issues and why there might be some reason to doubt the findings and the claims made by the NHS hypnotherapeutic technique which proposes that people don’t need to use any willpower to lose weight, their unconscious will do all the work because the technique will rewire their conscious thoughts. I spent an hour being interviewed, and several of the questions concerned topics such as, ‘why is it that people say they have lost weight using this technique?’, and to speculate why it might be that people on the programme that would trial the technique might also lose weight, even if I’m suggesting that the method itself is unlikely to be effective because the evidence for it working is weak, and the theoretical basis for it is flawed? My answers to these questions were that there are statistical reasons for why it is that some people will show that they have lost weight as a result of the technique, but that has nothing to do with the technique itself. It is more to do with understanding random fluctuations in behaviour in samples that are tested. Also, the psychological factor is that, once people tell other people that they want to lose weight, and that they are going on a programme on national television (where they are filmed before and after the method), this places a high incentive on them to try to lose weight. Actually losing weight then may have nothing to do with the technique itself, but more to do with the willingness, motivation and commitment people will put in to do the mundane things that are absolutely necessary to lose weight, which is eat less fatty food, eat more healthily, and exercise more. So, I spent an hour discussing these things, giving very clear and cogent reasons and examples (which they had specifically asked for) to demonstrate why it is that the method they were asking me to talk about is problematic, and should be considered with a huge degree of scepticism. Obviously I didn’t get it wrong, because it was what I had predicted, but the piece was edited in a way to show that the value of one or two people’s experience is of equal or more weight than the value of 15 years worth of study in a field of work, which entails summarising thousands of data points. This does nothing for helping people understand core issues to do with sampling, statistical inference, the value of a good causal understandings of evidence, the value of expertise, and the need for scepticism. 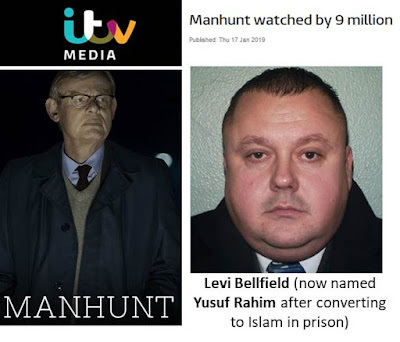 The ITV 3-part Series "Manhunt" starring Martin Clunes tells the story of the search for the killer of Amelie Delagrange who was murdered in Twickenham in 2004. It is based on the book by Colin Sutton (who was the detective in charge of the case) and dramatises his fight to find Amelie's killer, Levi Bellfield, who was also charged with the murder of Marsha McDonnell and three other attempted murders. The trial of Bellfield for these five crimes took place at the Old Bailey in 2008. He was convicted of the two murders and one of the three attempted murders (he was also later charged and convicted of the murder of Milly Dowler). The CCTV image of the car at the scene of the McDonnell murder: none of the letters or numbers on the number plate were clearly visible. A number of image experts provided (contradictory) conclusions about which characters could be ruled out in each position, so there was much uncertainty about how many number plates needed to be investigated; additionally at least two of the experts had been subject to confirmation bias because - instead of being presented with the grainy CCTV image and asked to say what the number plate could be, they were shown Bellfield's actual number plate and asked if the image was a possible match (as a result our colleague Itiel Dror was co-opted as an expert witness in the area of confirmation bias). The prosecution claimed to have 'eliminated' all possible vehicles with 'matching' number plates other than Bellfield's. This was important because, if true, it represented the most solid piece of evidence against Bellfield in the entire case. However, taking account of the uncertainty of the image expert assertions, we concluded that potentially thousands of additional vehicles would need to be eliminated. Lack of hard evidence: The dramatisation was correct in showing that, although there was much circumstantial evidence linking Bellfield to the murder of Delagrange, there was no direct evidence in the form of either forensic evidence or eyewitnesses to the crime. Hence, DCI Sutton's strategy was to link Bellfield to a number of other 'similar' crimes that had taken place within the same area. The programme focused on two of the four for which he was charged, namely the McDonnell murder and one other attempted murder, for which the programme used a made-up name "Sarah" (the credits make clear that some names were deliberately changed). The "Sarah" case actually refers to Kate Sheedy who was deliberately run over with a car. The other two cases of attempted murder (which I will refer to as R and D) were not covered. Again (as the dramatization suggested) there was no direct evidence linking Bellfield to either the McDonnell or "Sarah" attacks, but much circumstantial evidence. By providing circumstantial evidence linking Bellfield to five crimes which were claimed to be 'very similar', DCI Sutton was able to ensure that Bellfield was charged with the Delagrange murder. · Suppose Crime A and Crime B are so similar that it there is a very high probability they have been committed by the same person. · If there is evidence to support the hypothesis that the defendant is guilty of Crime A then this automatically significantly increases the probability of him being guilty of Crime B, even without any evidence of Crime B. It is perfectly allowable to use the probability of guilt in Crime A, as evidence for Crime B. 49. This subtle difference leads to a fallacy in the following scenario that is relevant to this case. · Suppose that there are three Crime A, B and C. Suppose that the evidence that crimes B and C are similar is strong. Then as above, any evidence that indicates guilt in the case of crime B will, because of the evidence of similarity, impact on the probability of guilt for crime C. However, suppose that we have not yet heard any evidence on crimes B and C and suppose that there is no evidence that Crime A is similar to either Crime B or C.
· If there is strong evidence supporting probability of guilt in crime A, then, contrary to the prosecution claim, this evidence does not impact on the probability of guilt for either crimes B or C and hence should not be used as evidence as suggested in point 48 above. · In fact in this scenario the evidence concerning crime A should, in relation to crimes B and C, be treated just the same as ‘previous conviction’ information in normal trials. 50. Given that the judge has allowed ‘cross admissibility’ of all 5 cases the danger identified in point 49 presents an opportunity for strategic exploitation by the prosecution. Specifically, the opportunistic strategy is to focus on an offence in which there is most hard evidence, even if that is the least serious offence and even if it bears the least similarity to the others. The prosecution can then argue that evidence of guilt in that case can be taken as evidence of guilt in the more serious cases. The jury would not necessarily be aware of the underlying fallacy. With hindsight point 50 is especially pertinent because, in contrast to the DeLagrane, McDonnell and "Sarah" cases, there actually was some direct evidence linking Bellfield to the R and D attacks (neither of which resulted in serious injury to the victims) and there were few similarities between these and the other three cases. The jury were allowed by the cross admissibility ruling and (in my view the incorrect) assumption of similarity to use evidence in the R and D attacks as evidence in the other cases. Interestingly, the Jury did not find Bellfield guilty of either of the R or D attacks. These fallacies are all covered in our book and some (in the context of the Bellfield case) are covered in this paper. Sally Clark revisited: another key statistical oversight? Prosecutor fallacy in Stephen Lawrence case? 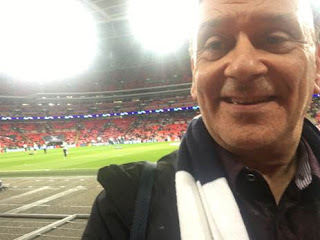 Norman Fenton is Professor in Risk Information Management at Queen Mary University of London and also a Director of Agena, a company that specialises in risk management for critical systems. 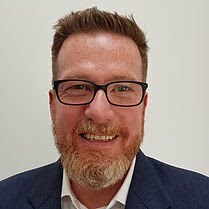 Martin is Professor in Computer Science and Statistics at QMUL and a Director of Agena Ltd.
Book "Risk Assessment and Decision Analysis with Bayesian Networks"